The purpose of this review is to discuss the pathophysiology of neurogenic SUI in the female patient, examine the evidence supporting surgical and non-surgical treatment options, and outline our recommendations for the care of this population. AFPVS appears to be more efficacious than MUS for this group; however, almost all patients will require self-catheterization after surgery. MUS have a higher probability of maintaining spontaneous voiding but also care the risk mesh complications and higher failure rates. Bladder neck AUS placement may also be considered, but most studies show high reoperation rates and have only a few female subjects. In severe refractory cases of SUI or in the setting of urethral erosion, bladder neck closure has been shown to have good continence outcomes. SUI in the setting of neurogenic lower urinary tract dysfunction is often more severe and harder to address than non-neurogenic SUI, due in part to the high rates of ISD in this population. Patients should be screened for other causes of urinary incontinence with UDS prior to any invasive interventions. AFPVS is an appropriate first-line therapy for these patients, particularly in individuals who already perform self-catheterization. Finally, in the setting of moderate to severe urethral erosion, bladder neck closure or urinary diversion should be strongly considered. Elizabeth V. Dray, Anne P. Cameron, and Rachel Bergman declare that they have no conflicts of interest. •• Gajewski JB, Schurch B, Hamid R, et al. An International Continence Society (ICS) report on the terminology for adult neurogenic lower urinary tract dysfunction (ANLUTD). Neurourol Urodyn. 2017;(July):1–10. doi: https://doi.org/10.1002/nau.23397. Recent standardization of terminology for ANLUTD . Nager CW, Brubaker L, Litman HJ, Zyczynski HM, Varner RE, Amundsen C, et al. 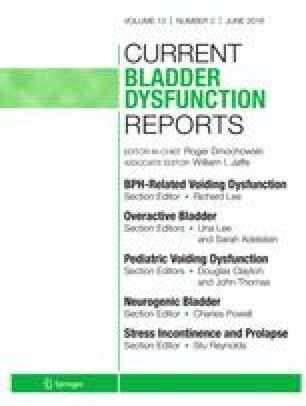 A randomized trial of urodynamic testing before stress-incontinence surgery. N Engl J Med. 2012;366(21):1987–97. https://doi.org/10.1056/NEJMoa1113595. Kirchin V, Page T, Keegan PE, Atiemo KOM, Cody JD, McClinton S, et al. Urethral injection therapy for urinary incontinence in women. Cochrane Database Syst Rev. 2017;7:CD003881. https://doi.org/10.1002/14651858.CD003881.pub4. Kobashi KC, Albo ME, Dmochowski RR, Ginsberg DA, Goldman HB, Gomelsky A, et al. Surgical treatment of female stress urinary incontinence: AUA/SUFU Guideline. J Urol. 2017;198(4):875–83. https://doi.org/10.1016/j.juro.2017.06.061. Schierlitz L, Dwyer PL, Rosamilia A, Murray C, Thomas E, de Souza A, et al. Effectiveness of tension-free vaginal tape compared with transobturator tape in women with stress urinary incontinence and intrinsic sphincter deficiency: a randomized controlled trial. Obstet Gynecol. 2008;112(6):1253–61. https://doi.org/10.1097/AOG.0b013e31818db391. Reuvers SHM, Groen J, Scheepe JR, et al. Heterogeneity in reporting on urinary outcome and cure after surgical interventions for stress urinary incontinence in adult neuro-urological patients: a systematic review. Neurourol Urodyn. 2017;(May). doi: https://doi.org/10.1002/nau.23364.